When I saw the Leaf Punch in the Holiday Catalogue, I knew I had to have it. There are so many ways to use the punch - especially as part of the Painted Harvest stamp set which it coordinates with. But there are so many other ideas that are appearing! 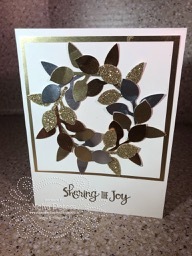 Here's a card that I received from my friend Diane Evans that uses leaves cut out of different metallics to create a wreath. Isn't it a WOW card! But so easy. It's even more stunning in person! Did you see my posting about Stampin' Blends? These new alcohol markers will be available starting November 1st! I've been playing with mine and they are amazing. Interesting in more information? Check out my blog post from last week. You can place your order tomorrow through my Online store or you can email me.